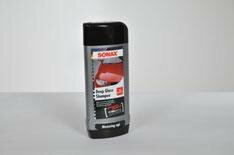 Sonax Deep Gloss Shampoo | What Car? Sonax Deep Gloss Shampoo lathered up well and its smell wasn't overpowering. The correct amount was easy to dispense thanks to a measuring cap, and the risk of spillage was much reduced by the handy spout. It felt a little thin and didn't carry through the premium feel of the packaging. It did get rid of most grime, although there were more than a few black spots it didn't manage to shift. The finish wasn't as startling as some of the other products we tested either. At 4.99 this product is good value.